Greyhound racing is among the cruelest forms of entertainment, one which has resulted in countless injuries and deaths for dogs both on and off the track. But the racing industry itself is now the one that's dying. "Greyhound racing is out of sync with our modern values, the way we look at dogs today, and it's failing economically," anti-dog racing campaigner, Carey Theil, told The Dodo. "There's no doubt in my mind that it will be phased out in the United States. The only question is how long that takes." To date, 39 states have passed legislation prohibiting dog racing amid well-founded concerns over animal welfare. But in the surest sign yet that the races are in their dying days, even the remaining racetrack operators say the industry is failing. 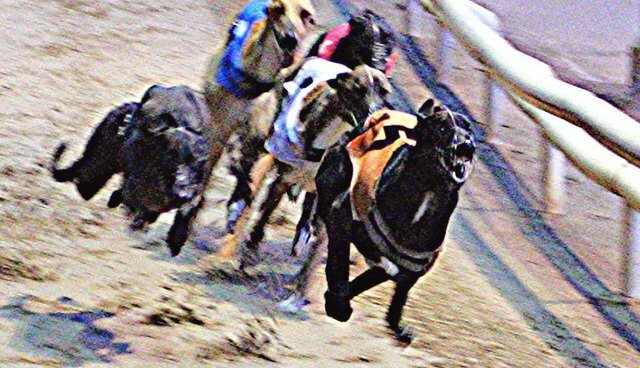 Florida is home to more than half of the nation's dog racing tracks, and the cruel competitions have faded dramatically in popularity, so much so that track owners want the races to stop - they cost them a lot of money each year. But they can't close their tracks because a 1997 state law requires them to continue hosting nearly as many races as they did two decades ago in order to keep their profitable poker rooms open. Izzy Havenick runs the Naples-Fort Myers Greyhound Track and Poker Room, which was founded by his grandfather. He recently told Al-Jazeera America that he loses money with every race that's hosted at his track. "We're legally obliged to keep a business operating that loses $2.5 million a year," he said. Havenick also described witnessing the decline of dog racing firsthand. Twenty years ago the track was "packed," he said, but now people his age "have no interest in going to some facility and watching an animal run around in a circle." Meanwhile, track operators aren't the only ones taking a hit from the dying industry. Since 1990, the amount Florida has collected in taxes and fees from dog racing has plummeted by 98 percent, according to the ASPCA. Last year, lawmakers there failed to reach an agreement that may have spelled an end for the dog racing industry, but State Sen. Garrett Richter admitted it was probably only a matter of time before they did. "Even if comprehensive reform is not in the cards for this session, we need to keep trying to find a graceful transition away from greyhound racing,'' Richter, a Republican, told The Tampa Bay Times. "Industry representatives concede today that it's a dying sport." Other states that still allow dog racing are looking to close their tracks because of the financial burden they carry. A recent report commissioned by lawmakers in West Virginia found that attendance at some tracks had collapsed by 99 percent in 30 years, leaving a razor thin margin of revenue over the taxpayer cost of regulating it. "It's a spectator sport that not many people are spectating anymore ... We can't keep propping up an industry that's not generating enough money to sustain itself," W.Va. State Sen. Jeff Kessler told the The Wheeling Intelligencer. The economic downside of dog racing is, of course, just the tip of the iceberg, says Theil, whose group GREY2K USA is campaigning to end the practice in the United States. "I'm referring to the use of things like confined housing, keeping dogs in cages barely large enough for them to turn around, the use of anabolic steroids and the injuries they suffer regularly," he said. "We see broken legs, broken necks, paralysis, etc. on these tracks," he says. Ending the practice can't come soon enough. According to a report from News-Press.com, a dog died every three days on tracks in Florida alone between June 2013 and December 2014. To learn how you can get involved in ending dog racing once and for all, visit GREY2K USA's website here.